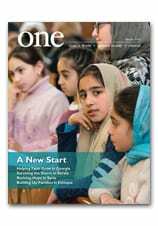 One-to-One is a group weblog by the worldwide staff of Catholic Near East Welfare Association (CNEWA). Here, we hope to spread the word about the work of our agency, share news about what is happening in the regions we serve, engage readers in thoughtful dialogue, and offer inspiring glimpses into the world of CNEWA. CNEWA is a lifeline for those in need throughout the Middle East, Northeast Africa, India and Eastern Europe. to support the pastoral mission and institutions of the Eastern Catholic churches. to provide humanitarian assistance to those in need without regard to nationality or creed. to promote Christian unity and interreligious understanding and collaboration. to educate people in the West about the history, cultures, peoples and churches of the East. CNEWA does not have inflexible priorities — they are set based upon time, place and urgency of need. We do not compete; if other agencies are doing a good work, we leave it to them. CNEWA addresses those needs that would otherwise fall through the cracks, enabling the power of love to reach men, women and children in need. From training priests to serve the people of God in India to providing clean water systems to war-damaged villages in Lebanon — from providing job opportunities to unemployed Palestinians to caring for orphaned children in Ethiopia — from providing health care to the poor in Iraq to awarding scholarships for Orthodox priests to study in Catholic universities in Rome, CNEWA connects generous North Americans with those in need living in some of the remotest parts of the world. The agency publishes a bimonthly magazine, ONE. Its name identifies the real spirit of CNEWA and its work — it is about one God, one world, one family and one church. Operationally, CNEWAs charism is always to act as if we are all one, unless we are forced to encounter a difference. To read more about CNEWA and our history, visit our web page at www.cnewa.org.